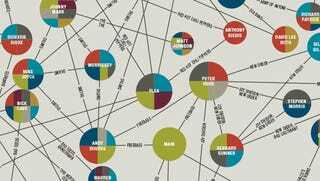 Pop Chart Lab has put together a new print titled "The Charted Connections of Rock," which shows how over 700 artists have collaborated on over 500 projects as an enormous web diagram. It's pretty dense, but useful for "six degrees of separation" games for the musically inclined. Color-coding refers to the role each musician played in each band. The full graphic is below, but it still might be a bit tough to read; you can see a much larger version here.